Hearts Embrace is a proposal for a temporary installation in middle of Times Square. Inscribing a temporary collective space, it shapes a moment of intimacy and calm in the middle of Duffy Square. 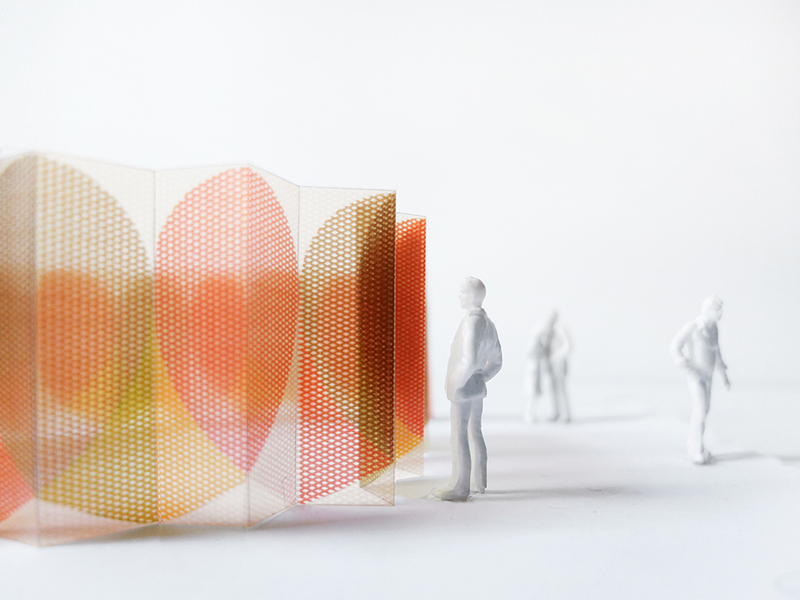 A series of folded perforated metal panels create a diaphanous colored screen that softly filters its surrounding context. Like a stage scrim in the light, it comes in and out of view inviting passersby to enter. It remains both background and foreground, as its subtle presence constantly transforms with changing light through the day and night. Departing from the purely telegraphic, this pieces is an attempt to offer respite from the cacophony of blazing lights, sounds and endless frenzy of its surrounding site – a ghostly color veil set to create a momentary pause right in the heart of Times Square.